The U.S. 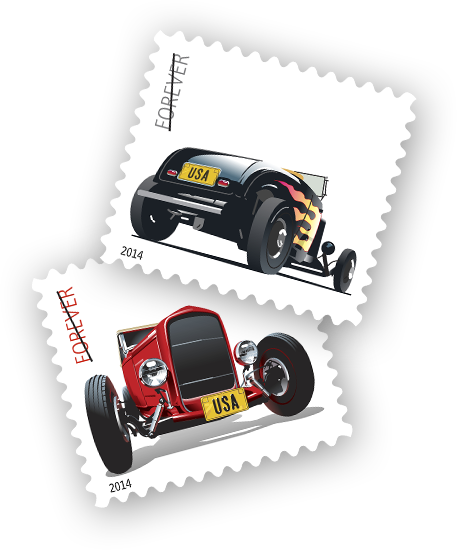 Postal Service has unveiled its Hot Rods Forever Stamps, depicting two icon 1932 Ford roadsters; a black â€œDeuceâ€ adorned with orange flames, and a striking red roadster, representing what many enthusiasts consider to be the â€œthe hottest Â hotrods of them all.â€ .The term “Deuce,” referred to the last number of its model year. The sport took root in Southern California during the 1920s, a time when young men first began modifying Model T‘s and Model A‘s. They lowered the chassis and chopped up the bodies to reduce excess weight and increase speed. However, the cars were not referred to as ‘hot rods’ until after World War II when returning vets began finding a new outlet for their mechanical skills. A new cultural and social status surrounding the cars was also introduced. Designed by Derry Noyes of Washington, DC, the two stamps were digitally created by artist John Mattos of San Francisco, and dedicated by the Postmaster onÂ June 6thÂ at a ceremony at the National Street Rod Association (NSRA) Street Rod Nationals East Plus at the York Expo Center in York, PA.
Also on hand at the event were Car Crazy TV host Barry Meguiar and NSRA Special Events Director Jerry Kennedy. “With an estimated 12 million hot rodders in America today, I applaud the Postal Service for recognizing that Hot Rods will forever be a symbol of our American culture,” said Meguiar. Available in booklets of 20 stamps, customers may purchase the stamps at usps.com/stamps, at 800-STAMP24 (800-782-6724), at Post Offices nationwide and on eBay at ebay.com/stamps. Customers have 60 days to obtain the first-day-of-issue postmark by mail. They may also purchase new stamps at local Post Offices, at usps.com/stamps or by calling 800-STAMP-24. 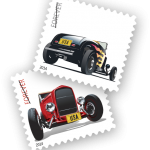 Stamps should beÂ affixed to envelopes of their choice, address the envelopes to themselves or others and place them in larger envelopes addressed to: Hot Rods Stamps, Â Postmaster, 3435 Concord Rd. 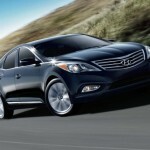 Completely redesigned for 2014, the Hyundai Azera is a knockout of a sedan. In years past, it seemed the Azera-in the near luxury market-was lost among all the other outstanding Hyundais; namely, the Sonota and Genesis. Not much on looks, the Azera seemed to struggle along, although this writer isnâ€™t aware of what sales statistics are. Along with the Azeraâ€™s competition in the near luxury, midsize market, the Azera has been redone from head to toe. One of the better cars in this market, the Azera is aimed toward those buyers who appreciate design. Building on the â€œfluidic sculpture,â€designers have added details that canâ€™t be missed; such as sculpted LED taillights, side mirrors with built-in turn-signal indicators, and HID xenon headlamps on the exterior. Inside the Azera is an updated cockpit, dash, blue accent lighting and a distinctive two-tier layout. Materials are classier and attractive, and the upholstery upscale. If one is looking for style and comfort, the Azera provides both. Looks and charm abound and isnâ€™t missed on this writer. Our test vehicle came equipped with Hyundaiâ€™s standard engine, the 3.3-liter V6 engine that is smooth and responsive. Hyundaiâ€™s six-speed automatic transmission plays a big part in the V6â€™s smooth performance, along with the Sportronic manual mode. Azeraâ€™s six-speed transmission has a wide range of gear ratios that make for quick takeoffs, plenty of available passing capacity, and great over-the-road cruising. Hyundai has re-tuned the Azeraâ€™s electric power steering. Bumps and most road surfaces are navigated with ease and driving this car is a pleasure. The Azera has that luxury car feel, and offers ample rear leg room. Driver and passengers can adjust their seating to several positions. Heated and cooled ventilated seats were an option on our test vehicle. According to the IIHS (Institute for Highway Safety testing) rated the 2014 Hyundai Azera top â€˜goodâ€™ scores in front, side and rear impact tests, including roof strength. All frontal and side tests came out on top, as well. A rearview back-up camera is included, as well as blind-spot mirrors for 2014. Safety equipment abounds, as expected and includes dual rear side-impact bags, impact reducing front seats, ABS, vehicle stability management with traction control. Other standard features include tilted, telescopic steering wheel, tire pressure monitoring system, front driverâ€™s knee and curtain airbags and daytime running lights. Offered in two models, the 2014 Azera is available in Azera and Azera Limited. Push-button start and proximity key entry are standard features. 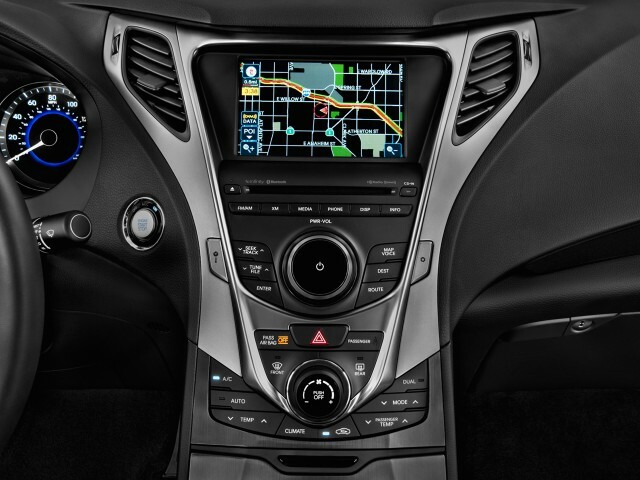 The base car features Bluetooth connectivity, and six-inch display system with six Mobis speakers. On the Limited model, the upgrade is to a 450-watt Dimension sound system which includes XM satellite radio, HD radio, iPod/USB connectivity and auxiliary input jack. A navigation system is also included with an eight-inch touch-screen display.Â Another nice touch on the Azera are the rear reading lights, rear parking assistance. Our Limited version Azera came equipped with the Premium package which includes 19-inch Hyper-silver alloy wheels with P245/40R19 tires, panoramic tilt-and side sunroof, power rear sunshade, manual rear side window sunshades, rear parking assistance system ($2,150), and carpeted floor mats ($110). Itâ€™s no secret we love our Hyundai vehicles so showing a little bias canâ€™t be helped. Up until 2012 though, Azera wasnâ€™t terribly inspiring and I suspect didnâ€™t get many second looks. Not so for 2014. With the right curves, the new Azera reeks of upscale, contemporary styling in what could otherwise be a dull sedan. Azera can be had in eight exterior colors, with hues of white, black or gray. Our Silver Frost Metallic Limited was handsome, in spite of its now overly common color. 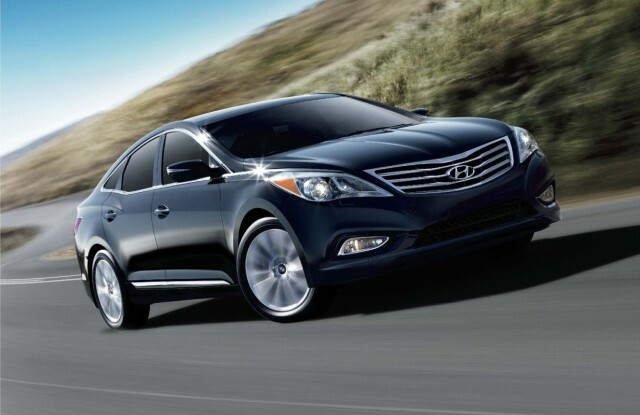 Â Blessed with an easy going attitude, the 2014 Hyundai Azera relaxes its driver as it hums along. Elegant, yet powerful, Azera looks great in its new sheetmetal. EPA fuel Economy: 19/29/23 mpg. Warranty: 5-yr./60,000-mile new vehicle; 10-yr./100,000-mile powertrain; 7-yr./unlimited anti-perforation; 5-yr./unlimited roadside assistance. 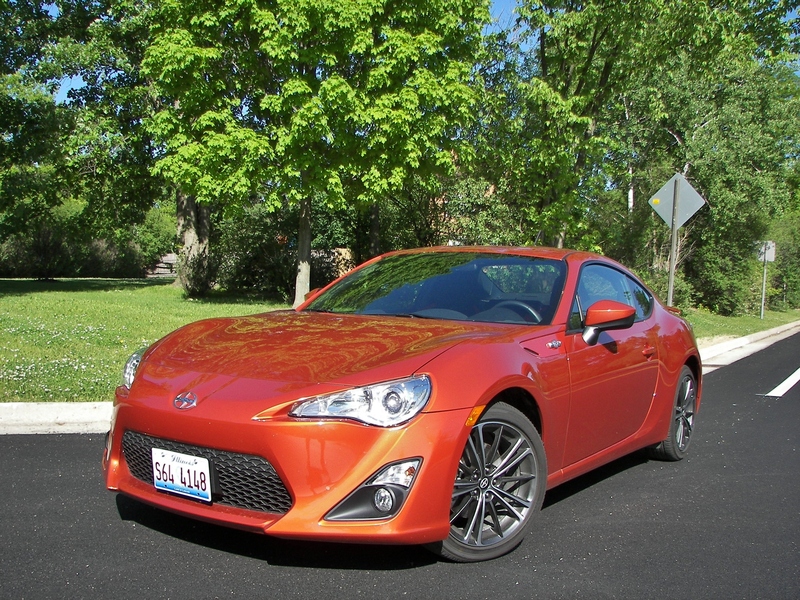 One of a few â€˜affordableâ€™ sports cars, theÂ 2014 Scion FR-S ranks number one with some of the automotive press. As part of the Toyota family, reliability and safety are a given in the Scion products. Obvious competition includes the Chevrolet Camaro, Nissan 370Z, Mazda Miata MX-5 and its twin, the Subaru BRZ. 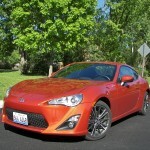 In its favor are the FR-Sâ€™ styling cues, available colors, six-speed manual transmission and fun-driving dynamics. Our test vehicle came in a â€˜whatâ€™s old is new againâ€ copper color: Hot Lava. 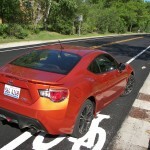 Believe it or not, the FR-S seats four and has rear-wheel-drive. Rear seating? We didnâ€™t try it out but suspect you have to be 5 years old or an adult with very short legs. Never mind, use it for cargo. What â€˜realâ€™ sports car has rear seats, anyway? Not much is new for 2014. Four available versions can be had including the 2-door coupe automatic, 2-door manual, 2-door automatic Monogram and 2-door manual Monogram.Â Our test vehicle came in the Monogram trim level. AÂ 2-door coupe with manual transmission, our test vehicleÂ carried a MSRP of $24,700, and with options that included fog lights ($490), rear spoiler ($399), all-weather mats ($90), THD Exhaust System ($1,100), a total vehicle price of $27,534. I suppose one could forego some of the options to bring the FR-S down to more affordable pricing for those young drivers wanting to get into this vehicle. This writer prefers the ever-popular Miata MX-5 for agile handling and fun factor. The FR-S, a tad stiff for our liking, did grow on us after a few days, however. Once adjusted to its quirks, this driver felt more comfortable and began enjoying working the manual transmission. The interior leaves a little to be desired: namely, the use of plastic materials. The seats are comfortable and form-fitting, adjust easily and bolstered sides make for a better fit for all drivers. One canâ€™t complain about space-or the lack thereof. You donâ€™t buy a car like the FR-S if youâ€™re worried about having enough space. Get a backup SUV. Cargo room is also at a premium. One can tote quite a bit. The lighted dials are a nice touch and feels sporty. A fun car to drive on most roads, the FR-S is no Camaro or Mustang when it comes to power. But thatâ€™s ok. This is a car to appeal to the young driver who wants a great looking ride. Working his/her way up to a Mustang is expected. As noted above, our test FR-S came equipped with the optional THD exhaust system, making for a great sounding growl. 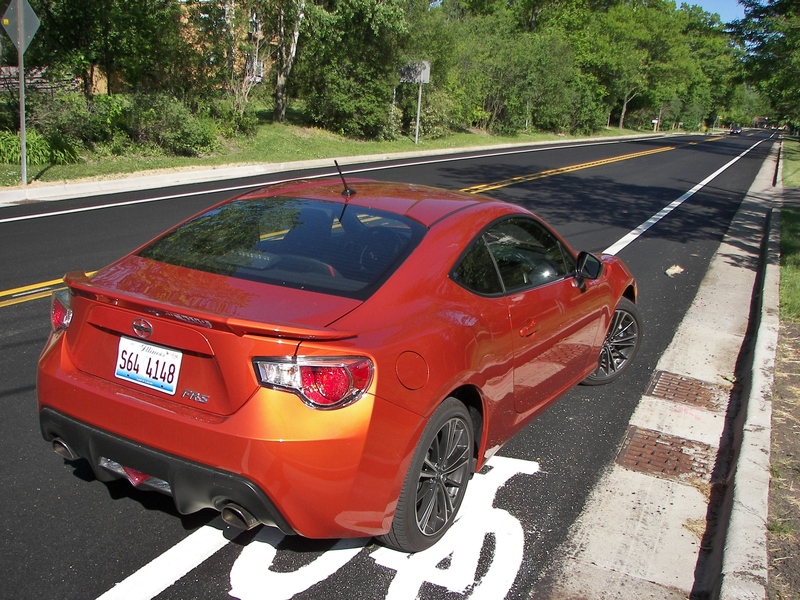 Standard equipment on the FR-S includes chrome-tipped dual exhaust, color-keyed power outside mirrors, projector beam Halogen headlamps, LED taillights and center mounted stop lamp, and intermittent front wipers. The Pioneer 6.1-inch touch-screen display audio 300-watt AM/FM/CD/HD radio, eight speakers,Aux/USB port with pod connectivity, hands-free phone capability and music streaming via Bluetooth wireless technology. This writer was not impressed by the sound system in the FR-S and in fact, elected to play her own CDâ€™s rather than try and figure out how it worked. The sound quality is poor and there wasnâ€™t any XM/Sirius option. Power door locks/mirrors/windows are all standard, as are leather-trimmed steering wheel/shift knob. Also included are cruise, A/C, rear window defogger, aluminum sport pedals, one-piece folding rear seatbacks, multi-info display and floor mats. Fuel tank capacity: 13.2 gal.